The vibrant city of Udaipur with its historical background proves to be one of the most popular tourist location of India. The glorious lakes that come with their own set of picturesque areas make it more intriguing a city. Since it consists of many tourist attractions, Udaipur’s Lake Palace is no exception. Charming as it is, the Lake Palace, situated in the middle of Pichola lake on the island named Jag Niwas, is one of the most Beautiful places of Udaipur. Not only does the heavenly lake palace have a backdrop of the Aravalli Hills, it is made entirely of white marble, giving it an allure like no other. The Lake Palace has it all, be it sprawling gardens, terraces, splendid architecture or beautiful fountains. It was built by the Raja of Udaipur, Maharana Jagat Singh II in the year 1746, which, during later times, was used as a summer palace of many other members of the royal family. 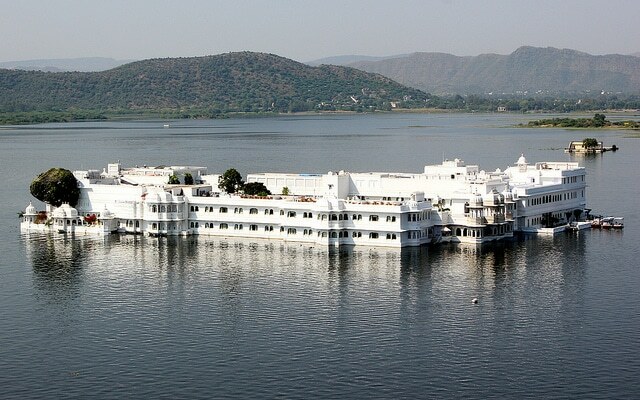 The exquisite floating palace, which has now been transformed into a five-star hotel, provides just as much of a royal treatment as the Maharanas of Udaipur received back in the day. There are a number of rooms inside the palace, including those of Phool Mahal, Bada Mahal, Ajjan Niwasand, Khush Mahal and Dhola Mahal, which consist of gorgeous paintings, crystal and tarnished glass work, and green and pink lotus leaves of inland stones. The Jaisamand Lake is famous for being the second largest man-made freshwater lake in Asia. Created by Maharana Jagat Singh II in 1754 AD, the lake palace was later converted into luxury hotel in 1960 AD. Visit the restaurants, which have great performances by flamenco dancers, offer delicacies like authentic Mewari cuisine and European food. The Vintage and Classic car collection in the palace boast of the vehicles used by many of the Maharanas of Udaipur, some of which are also used presently by descendants of the royal line. While at the Lake Palace in Udaipur, the most important thing a tourist must carry is a camera. With the innumerable stunning things to capture in and around the Lake Palace, one can never regret taking a camera along. Comfortable shoes for the long heritage walks on the streets of Udaipur, will also prove helpful during a casual stroll along the Lake Palace. Based on the time one visits, the appropriate weather necessities must also be carried: sunglasses, sweaters, umbrellas etc. Guests at the hotel are escorted through an adventurous boat-ride, and can expect a perfectly luxurious treatment throughout their stay. There are several attractions at the Lake Palace, including the museum tour of the palace that the guests can undertake at Rs.75 per person. Guests are escorted by the hotel staff and security for the tour. The Crystal Gallery, which consists of spectacular collection can be accessed with a fee of Rs.500 per person. A boat ride along the lake is priced at Rs.450 per person, providing the guests with a mesmerizing view of the Aravalli hills and the other beautiful palaces of Udaipur. Since Udaipur consists of many tourist locations, some of them are easily accessible from the Lake Palace. The City Palace, located at 0.32 kilometres from the Lake Palace is one of the most sought-after tourist spots of Udaipur. Bagore Ki Haveli consists of a beautiful folk-dance performance which is highly recommended based on the cultural vastness of the Mewar culture. The Jagdish Temple is also close by, one of the most pristine shrines in the heart of the city. The Mansapurna Karni Mata Ropeway ride, although short, gives an absolutely spectacular view of the lake and the city. The travel time is approximately 6-7 minutes, and costs Rs.96 per person. There are numerous art stores around the Jagdish temple, which consist of a variety of art and paintings, including miniature paintings depicting the culture and tradition of Udaipur. The rooftop restaurant in the Lake Palace hotel is one of the best parts of the royal experience that one can get, and with the stunning view of the lake below, it is also the most romantic location in Udaipur. The streets are filled with shops which consist of exotic fabrics and traditional artefacts that one can purchase at ease, since they come at a reasonable price. The Lake Palace is located at 26kms from the Udaipur airport, and 3kms from the railway station. Guests take a boat-ride provided by the Hotel Staff to reach the Lake Palace from the banks of Lake Pichola. 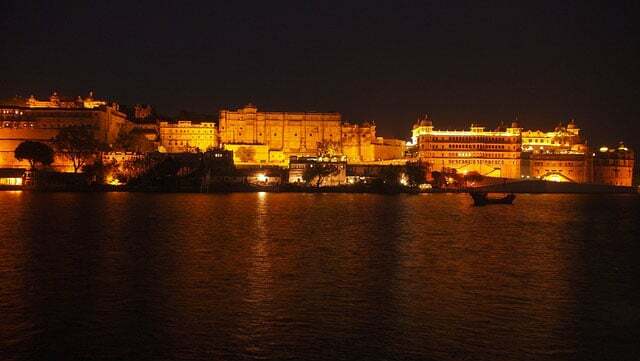 Udaipur’s beauty is unparalleled, and with the exquisite addition of the Lake Palace, the city becomes so much more attractive. With its breath-taking surrounding of natural beauty and incomparable architecture, Lake Palace will surely leave you with the experience of a lifetime.